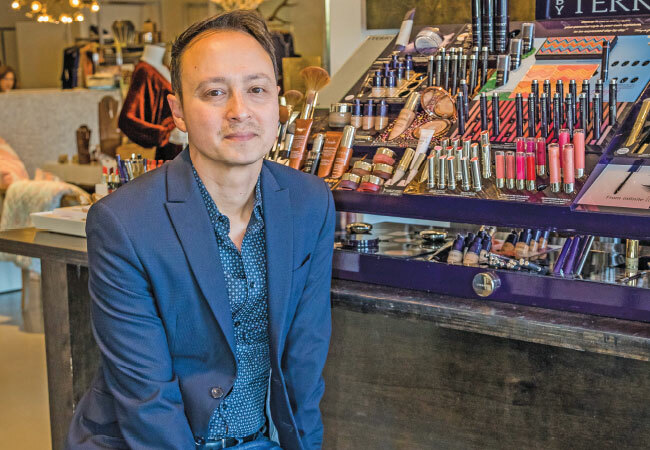 With his Chanel training, impeccable aesthetic and flawless blending techniques, local makeup artist Sloan Winters has created a signature cosmetics line that’s as effortless as it is elegant. He’s earned the reputation as the man who can create a smoldering, smoky eye that can make or break a magazine cover or a gala look, which is somewhat ironic for a makeup artist who has always preached less is more. If I’m going to offer something, I want it to be special." Special it is. From the meticulously-cultivated selection of neutral to knock-out eye colors (matte and shimmery “because people like what they like”) to the glow-y bronzers and the believable shades of blush, Winters has created a pared-down group of essentials that you can throw on and go or layer and combine for a full-on glamazon look. “This collection was created with the idea of building a wardrobe,” he says. You can start with beautiful everyday basics and add special effects. The pans of color fit into refillable compacts, placing everything you need in one chic little case that can be tossed in a purse, stored in your desk drawer for the quick, easy touch-ups which his formulas will undoubtedly deliver. “I’m known for my blending,” says the man who will talk anyone he can out of heavy foundation and powder. Not surprisingly, his colors melt into your skin for a luminous look that’s polished, but never cakey or overdone. Sloan developed his mad skills as a regional trainer for Chanel, flying from city to city to train their talent, and as an artist for cult-classic makeup artist lines Laura Mercier and Trish McEvoy. His technique is flawless and his touch light as air; his makeup definitely follows this aesthetic.